Successfully Added NV-440D+ Night Vision Monocular - 560M range, 4 x Zoom, 16GB Micro SD Slot, 1.3MP CCD, Built-in Camera to your Shopping Cart. The NV-440D+ Monocular with night vision makes the perfect portable tool for hunting, night orienteering, viewing wildlife, tourism and a range of security needs. 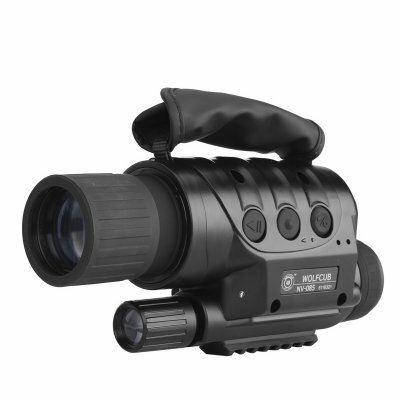 The NV-440D+is a professional digital night vision monocular popular for being one of the best and easy to use digital viewing devices on the market. It can be tuned to suite your eyesight as the lens is adjustable from -4 to 4 diopter. With a 2048 x 1536 resolution it brings superb detail day and night, an Ideal tool for getting close up views of wildlife without disturbing them, for navigation or a range of security needs. With a padded hand strap this handheld digital monocular is compact and easy to transport as it comes with its own carry case. A 1.4 inch thread is located on the base so you can mount the NV-440D+ on a tripod helping to get clean stable images. You can use the AV out to hook this monocular camera up to a monitor where you can view in comfort and record everything it sees. Equipped with a built in IR illuminator that has an auto on off switch the NV-440D+ boast an impressive zoom and night view for picking out details in the dark, featuring a highly-sensitive 1.3 MP CCD array this digital color night vision monocular is packed with everything you need. An outstanding well priced tool this Monocular is the perfect way to explore the world at night and should be a part of every nature lovers, emergency responders and security professionals kit. This NV-440D+ Monolcular comes with a 12 months warranty, brought to you by the leader in electronic devices as well as wholesale electronic gadgets..